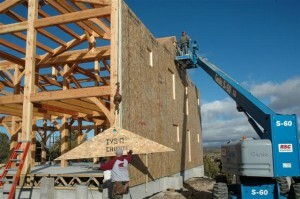 SIPs and Timber Framing - What are the Benefits? | Clydesdale Frames Co. 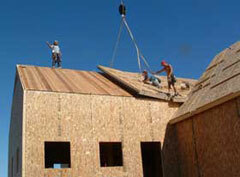 The world of Structural Insulated Panels (SIPS) gets more crowded and confusing everyday. 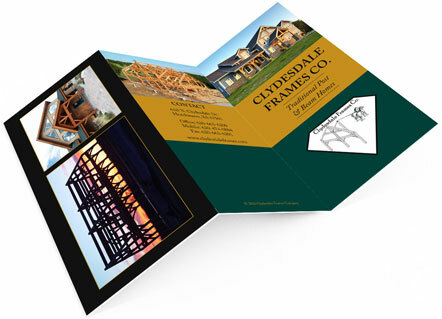 As timber framers, it’s our job to wade through the rhetoric and make some base conclusions which enable you, the homeowner, to make informed decisions. The panel companies nationally are separated by two markets. Urethane foam vs. EPS foam and Pre-cuts vs. Blanks. Urethane vs. EPS is the battle of R-Factor and adhesion. Urethane foam has a much higher R-factor per inch of thickness than EPS. EPS foam is glued to its inner and outer skin while urethane foam is bonded chemically to its inner and outer skins. Above: Wall panels are typically applied with a crane. Pre-Cuts vs. Blanks is the battle of greater pre-planning and faster installation. Pre-cuts demand much more pre-planning for window locations, electrical, etc. Blanks enable you to apply panels and then cut your windows in wherever you want. Blanks take much longer to apply and extended time for cutting openings for doors, windows, etc. Pre-cuts apply quicker and enable you to hang windows and doors without delay. Above: Getting closed in… As you can see, using panels 8′-0″ wide and 24′-0″ or so tall can make quick work of the close-in process. Our Conclusions: We recommend pre-cut urethane SIPS. We like the higher R-factor as well as the chemically bonded process of adhesion. With adequate pre-planning, pre-cut panels will speed up the “getting closed in” process. Furthermore, we feel NET ZERO Structural Insulated Panels has the best blend of services while also providing a pre-cut urethane panel. NET ZERO also provides installation services. This means your general contractor can concentrate on those aspects of building he is familiar with. In short: THE TIMBER FRAMERS RAISE THE FRAME… THE SIPS COMPANY HANGS THE PANELS… then it’s back to everyday building for the general contractor. Above: The T&G ceiling finish is most easily applied before the roof panels are installed. This reduces the labor needed to cut and fit each piece between the timbers. When you’re looking at different panel companies, there are many things to consider. Here is a small checklist to give you some direction. It’s not a complete checklist but it should help you compare many of the main points. What is the R-value compared to the panel thickness? Do they install the panels? Are they pre-cut or blanks? After those basics, it comes down to any bells and whistles that are important to you. Above: The panels are done! All that remains is windows, doors, and exterior finishes. Once completed, the house is weather proofed. We are asked many times how “the process” works with the panel company. To explain this, we will assume that you are having us prepare the architectural plans and that you are using panels from NET ZERO. 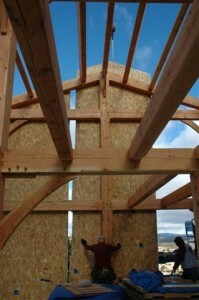 First, the frame drawings are completed and sent to NET ZERO. That will allow NET ZERO to give you a quote that lets you see whether or not you’re within your budget. If the project is still good to go, we then generate the architectural drawings. While you are looking those over and gathering quotes, we send them electronically to NET ZERO so that they can get their shop drawings completed. 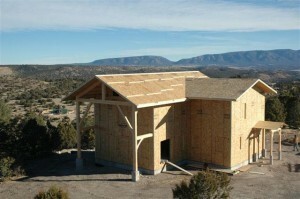 Before NET ZERO can cut the panels, they will need the electrical plan as well as the window and door rough openings. Once NET ZERO has all the information they need and the plans are drawn, they send them back to us for review. Once they have yours and our go ahead, they cut the panels. Because the panels are designed directly off our CAD drawings, the need for site adjustments if virtually eliminated.